Supa Dam is 101 Mtrs high and 332 Mtrs long concrete gravity dam, built across Kalinadi or Kali river Joida taluk of Uttara Kannada district in Karnataka. It is the second largest dam in the State. It has a catchment area of 1057 Sq. Km and the live storage capacity is 145 Tmc Ft (1000 Million Cubic Feet). Three radial gates of size 15 x 10 Mtrs are provided to regulate the flood discharge. The reservoir has two saddle dams of length 705 Mtrs and 940 Mtrs. The power house at the foot of the dam has two electricity generators of fifty megawatt each. They generate about 542 Million Units annually. 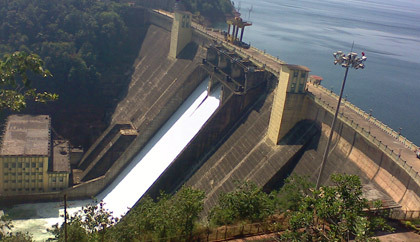 The dam is built and operated by Karnataka Power Corporation Limited. The power house was commissioned in 1985.